Moving Company Clarksburg: Why Call A Full-Service Moving Company? Why Call A Full-Service Moving Company? If you’re getting ready for a move, you’ve probably started planning your move out day and looking for moving companies in your area. But have you taken into consideration what services these moving companies offer? Many people are surprised to find that most moving companies don’t offer a full range of services. Instead, they simply offer the moving truck itself. The problem with this is that there’s more room for error. If you run into an issue during your move, they aren’t going to go out of their way to help. At Moyer & Sons, we’re proud to help with all aspects of a move including packing, loading, guaranteed safe delivery, unloading, and long-term and emergency storage. Read on to learn about the benefits of trusting a full-service company. Working with a full-service moving company is simply more convenient. When you call Moyer & Sons, you’ll never have to worry about going out of your way to call a storage company or put any unnecessary burden on a friend to help you out. If you ever encounter a complication during your move, all you have to do is let us know and we’ll take care of it for you. Need emergency storage solutions? No problem, we’ve got a 30,000 square foot storage facility to accommodate your belongings. Whether you need it just for a day or a whole year, we’re here to help! 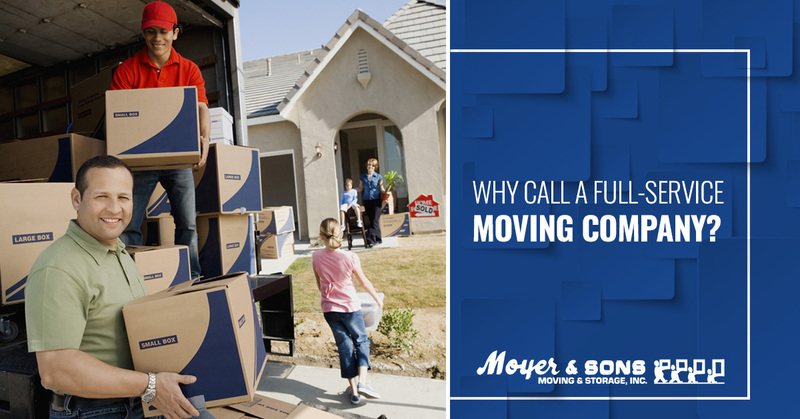 One of the most important reasons to work with a full-service moving company like Moyer & Sons is the cost. Having to hire a few extra hands to help you pack, load, or unpack your things will eat up your moving budget real quick. When it comes to storage solutions, many storage companies don’t offer short-term storage meaning you could be paying a lot more than you bargained for if you just need storage for a day. These companies also don’t offer any labor meaning all the work will be left in your hands when you have better things to be doing. Aside from being costly and inconvenient, going out of your way to work with other storage or moving companies is a huge time drain. Chances are, you want your move to go as quick as possible in order to eliminate any room for error and so that you can get back to living your life. Waiting for storage space to open up could add weeks or months to your initial moving duration. However, when you work with us, we’ll never miss a beat. If you have a change of plans, all you need to do is let us know and we’ll make it happen. You can rest assured that even in emergency situations, your belongings will be kept safe and secure in our large, state-of-the-art storage warehouse with 24/7 surveillance. As your local moving company in Clarksburg since 1969, Moyer & Sons is happy to offer a full range of services from packing and moving to storage and unpacking. We understand that it’s difficult to trust just anyone with entering your home and handling your belongings. That’s why we’re committed to your long-term success. We want to form a relationship with each customer so that if you ever find yourself in need of moving services again, simply give us a call and we’ll be there to help. We’re proud to announce our new location in Elkridge which allows us to better serve the Baltimore Metro Area while maintaining a high standard of excellence for all our customers. Give us a call today to learn more.